I've noticed that August usually brings with it a significant uptick in Planet X-related stories in the mainstream media. Lots of people go on holiday, companies go quiet, governments tick along and seek only to bury bad news this month, and no one's playing much attention anyway. So, bored journalists stuck in their offices when everyone else is having fun scrabble around to produce stories, sometimes from nothing at all, other times re-hashing previous material. More often than not, they simply nick each other's ideas. This year, the traditional August silly season has been marred by the rather unfortunate possibility of nuclear war. This kind of serious topic has no place in August, so most people seem to be consigning it to the desperate summer news schedule. I'm sure that if the threat of war on the Korean peninsula continues into September, then people will start to sit up and take notice, with the commensurate impact on stock markets, prospects of mass annihilation, etc. Anyhow, within that context, it's little surprise to see a story outlining the fears people have about Planet X, and how there may actually be an underlying reality behind the conspiracy theories (which there often is, in one form or another). 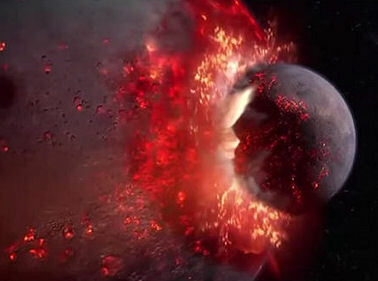 The celestial ball gets rolling by an online article in the Daily Star (1) which outlines the most recent nightmare scenario from the heavens, and then includes a family-friendly Planet X rebuttal on a YouTube video by NASA scientist David Morrison. Some of the detailed points he makes are arguable (about 'Nibiru' being a 'minor god in the Babylonian pantheon', and about how great an effect a perihelion transit by a Planet X object might have upon the solar system's architecture, for instance) but his general thrust is sound. Don't panic! Oh boy. Let's unpick this a little. Admittedly, with all the recent talk of a new Korean war, perhaps things aren't looking too good right now. But the prospect of Nibiru, or Planet X, 'appearing in our skies' is zero. Yes, zero. As the article rightly points out, objects in the solar system don't suddenly appear out of thin air, especially those transiting from the outer solar system. It takes years for them to move through the orbits of the planets to get within striking distance, and even amateur astronomers with backyard telescopes can pick up comets at quite a significant distance out from us in our cosy inner solar system sanctum. An incoming planet would easily have been spotted within the planetary zone some time back, if it was truly about to become a visible object in our skies. Some argue, and provide what they consider to be photographic and video evidence, of a planet hiding behind the Sun which will imminently pop out into the open. Again, not possible. The Earth moves around the Sun at a considerable clip compared to the slow-coaches from the outer solar system. So, much of a distant body's apparent movement across the sky is attributable to the Earth's own relative speed of transit around the Sun. Of course, planets do 'disappear' behind the Sun during their movements relative to us, perhaps for a month or two when the glare of the Sun wipes out their own dim reflected glow. Sometimes they are actually eclipsed. But they cannot remain there for long - it's just a matter of celestial mechanics. The planets continue their perpetual dance and reappear again. So it would be with Nibiru. These images of 'two suns' have been appearing for years and years. They can't all be true, because a planet from the outer solar system could not disappear behind the Sun for that length of time. So, which ones are true and which ones aren't? They all look the same. Which is because they are all lens flares, sundogs, camera artefacts from pointing an optical device at a bright local star and seeing how it handles the glare. Not particularly well, it turns out. He's not alone in believing that the solar eclipse is an omen. But David Meade goes further by linking it to forthcoming Planet X-related doom in his book (6). Here's the thing. 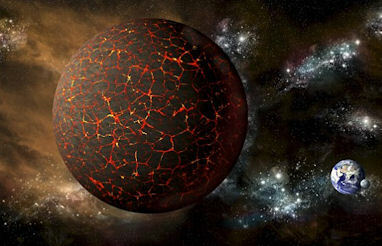 Nibiru is not a Christian invention. It is even not a Biblical story (although, arguably, relevant parts of The Book of Genesis may have been lifted from previous ancient Middle Eastern sources whose creation myths allude to the Nibiru mystery). 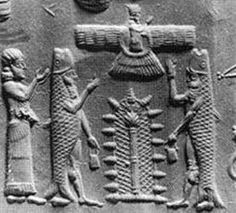 Let's be frank - Nibiru stems from a pre-Biblical pagan polytheistic tradition. If fundamentalist Christians have co-opted it for their own, then it's simply because it conveniently plays into their own dark narratives. Their stance is, at best, ironic, if you think about it. Normally, they spend their time damning the old religions. Not as bad as fundamentalist Muslims from so-called IS destroying the ancient monuments, it's true, but a general antipathy, nonetheless. If Nibiru is a bona fide Planet X object, as originally proposed by Zecharia Sitchin (an independently minded Jewish writer and scholar) (7), then it is currently way out in the solar system, offering no imminent threat whatsoever. True, its discovery out there may upset various academic apple-carts, but it is not about to destroy our world. We're quite capable of doing that ourselves, and need no help from distant planets, however much they may act as celestial omens of doom in some people's eyes. A recent article in an engineering magazine discusses the subject of Planet Nine in great depth. As well as providing snippets of an interview with Mike Brown from Caltech, it provides a useful guide to the variety of searches currently being carried out to locate this elusive object (1). 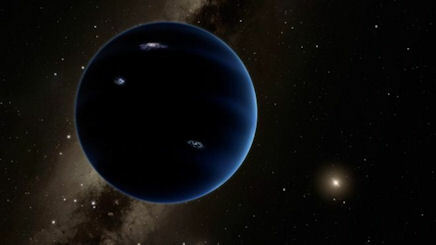 Mike Brown remains convinced that a Neptune-sized ninth planet is out there, located a couple of dozen of times further out from us than Neptune itself. The planet's orbit is eccentric and highly inclined, he argues, providing an off-set torque which has caused the entire solar system to twist out of shape over time. The existence of Planet Nine would neatly explain why the Sun's spin axis is at a six degree angle from the plane of the planets, rather than being perfectly perpendicular to it. This is but one of a number of solar system anomalies which are readily explainable by the presence of an off-kilter massive world out there, many of which I have previously discussed in Dark Star (2). Another is whether it is possible to account for total angular momentum of the solar system with just the objects we know about. It has been argued that the known solar system is missing a significant chunk of angular momentum (3). A massive Planet X object could help to explain the discrepancy, as calculated by a retired American engineer a few years ago (4). His calculations show that an object of several Jupiter masses is required to close the gap between the theoretical and observed values for total solar system momentum, an object I identify colloquially as a 'dark star', but which would more properly be described as a sub-brown dwarf. The proposed Planet Nine is significantly smaller than this. Perhaps it is simply one amongst many missing planets in the outer reaches of the solar system, but such a scenario would require a significant rethink about how planets form and disperse throughout interstellar space in such numbers. For Mike Brown, and his colleague Konstantin Batygin, the case for a single new world is enough to be getting along with, and has provided plenty of material for fervent debate within the astronomical community. Their initial evidence was built upon a clustering of distant objects in a scattered disk beyond the Kuiper Belt, called variously the sednoids, ETNOs and extreme SDOs (the jargon varies depending upon the which research group is writing about them). The clustering is non-random in a statistically significant way, but the correlation is built upon a fairly small grouping (5). That creates doubt among many astrophysicists, who argue that the small number of objects involved may have been picked out of a larger, more random distribution of objects (the rest of which remain unseen for the time being) through observational bias. The eccentric nature of their orbits means that they are only discovered if they are relatively close to the perihelion positions, the nearest points they can get towards the Sun. Because the range of searches conducted for distant objects such as these is limited, then there is the potential for a bias towards a select grouping of objects, which then might inadvertently give the impression of a common set of orbital properties. As more of these scattered disk objects come to light, then the true random nature of the distribution of ETNOs will become apparent, argue the sceptics (6). It follows that if the observed clustering is a mirage is simply a function of how the discoveries of these objects were made, then the case for Planet Nine would be put in doubt. Archived data from other sky searches is also being pored over to see if evidence for the planet already exists. It has often been the case in the history of planet discovery that the new planet had been previously observed, but not initially recognised for what it is. That may well be the case with a distant Planet X body, whose lateral motion across the sky is miniscule compared to closer objects in the solar system. It could have readily been misidentified as a background star, or other deep space object. Astronomers are beginning to use complex artificial intelligence programmes to search for exoplanets, using archived data from the sky searches conducted by the Kepler Space telescope. These kinds of analyses are in their infancy, but could potentially bring forth many distant planets lost in the murky white noise. There is hope among scientists that a similar approach could pull Planet Nine out from the woodwork (1), which would effectively make any newly discovered planet in the solar system the first to be found by machines! Much of my current research interests lie with the location of massive planets in interstellar space. Star systems are extensive tracts of 3D real estate, with the gravitational effects of the central star felt for a very considerable distance into surrounding space. The Sun, for instance, can control objects which lie as far as a light year out, which represents a full quarter of the distance to the nearest star. These kind of distances are enormous compared to the limits of what most people would identify as the edge of the solar system, which might extend out to, say, the most distant known planet Neptune, or the Kuiper Belt beyond it, or perhaps to the heliopause, which marks the limit of the Sun's magnetic field influence. The rest of the solar system beyond is vast, peppered by comets within the inner and outer Oort Cloud. This vast zone is technically in interstellar space, but objects within it are shepherded into orbits encircling the Sun. Planet Nine would fall into this category. Its existence, if proved, would extend the popular conception of the edge of the solar system from Neptune's 30AU out to perhaps twenty times that distance, perhaps more. in which case, the common definition for the edge of the solar system would change radically. But Planet Nine would be considered by astronomers to lie in interstellar space, within the flow of the broader galactic tides with their attendant Interstellar Materials (ISM), gas and dust and so on. So, it interests me as to whether planets can form and grow in such environments, well beyond the traditional scope of the protoplanetary disks that collect, rotate and evolve into planets during the early stage of a star system's lifecycle. Planets are known to exist in the space between stars. They are labelled as free-floating planets, sometimes planemos. It is tricky enough to spot planets around stars, despite the gravitational tugs they exert on the parent stars. It is far more difficult to find similar objects floating through the void, disconnected. So, observational bias is possible here, in several ways. Firstly, there's the exponential increase in difficulty to find planet-sized objects in interstellar space compared with similar objects orbiting stars (with the exception of young sub-brown dwarfs, which are self-luminous for a relatively short period in their early lives, quickly burning up the available fuels in their atmospheres before their lights are snuffed out forever). Secondly, there is the traditional assumption that planets are going to be similar to those we already know about - predictably furrowing obvious tracks close to their parent stars. So, those kinds of planets are sought over possibilities unthought-of. Thirdly, mechanisms for planet-formation favour accretion close to parent stars, within the proto-planetary disks, over, say, formation of planets independently in interstellar space of local nebulae. These assumptions and observational constraints add up to a significant bias in favour of the status quo. Yet, the observation of young free-floating sub-brown dwarfs shows how wrong those assumptions can be. I suspect that there are vast quantities of planets to be found in interstellar space, substantially outnumbering those around stars. It is already suspected that the categories of planets which are the easiest to find in interstellar space (the brightest needles in the haystack) - the sub-brown dwarfs, which I often call 'dark stars' - probably outnumber stars. Their numinous presence has been deduced within moving groups of stars. But I think this is the tip of a massive celestial iceberg. Because it fails to consider the potential for never-luminous planets at the lower ends of the planetary spectrum inhabiting the space between stars (gas giants, ice giants, super-Earths, terrestrial planets). Simply put, it is impossible to find these. Absolutely impossible. So, we are unable to quantify their populations. Assumptions are then made, which seem reasonable of course, because of underlying bias towards what we already know. 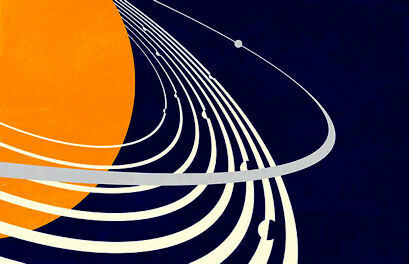 But it is absolutely possible that interstellar space is packed full of planets. We would simply never know. I've written about this before, drawing the attention of readers to concrete examples like the sub-brown dwarf 2MASS J11193254–1137466, thought to be a member of the large moving group of stars known as the TW Hydrae Association (1). Now, it turns out that this fascinating object may actually be a binary pair of smaller sub-brown dwarfs (2). Basing their calculations on the distance and age of the TW Hydrae Association, William Best of the Institute for Astronomy, University of Hawaii, and colleagues think that the distance between the two sub-brown dwarfs is about 4 astronomical units - an equivalent distance from the Sun to the outer asteroid belt. They're of equal mass (about 3.7 Jupiter masses each), and are rotating around one another (3). They are remarkable both for their low masses as sub-brown dwarfs, and also their identity as a binary coupling, free-floating in interstellar space. Recent work has shown that stars may all begin life as binary objects, which emerge from 'dense cores' within birth clusters (4). Later in the star's evolutionary journey, the binaries may, or may not, split apart. In that sense, then, it may not be too much of a surprise that a relatively young duo of sub-brown dwarfs (a mere 10 million years old, it is estimated) would be found revolving around one another. But that would be assuming that they have formed within their own segregated dense core, away from a larger parent star, rather than having been ejected very early on from a larger system. Some massive free-floating planets and brown dwarfs are thought to form from tiny nebula fragments, known as Gahm globulettes, which break away from the edges of larger nebulae (5). So, they may have formed in this way, from a dispersed dense core of dust and gas to create a binary sub-brown dwarf system independent of the rest of the stellar cluster. Many exoplanets have been discovered orbiting distant stars over the last few decades. Most are inferred from wobbles in the parent star's position in space. 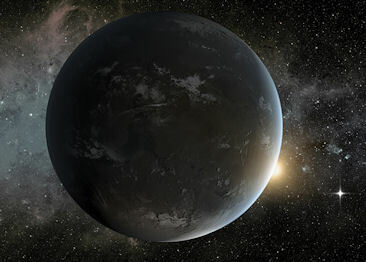 In other examples, a massive exoplanet might pass in front of the star periodically, slightly eclipsing the star and lowering its luminosity for a short time. Seeing this periodic variability enables astronomers to infer the planet's presence. Less common are directly observed exoplanets. Planets are difficult to spot in the overwhelming glare of the star, rather like trying to see a lit match behind full-beam headlights. 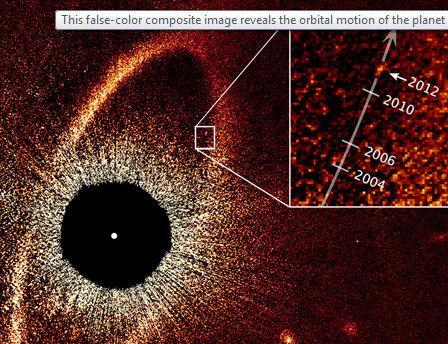 The first planet to be directly observed in visible light was Fomalhaut b, back in 2008. It turns out to be a very unusual world orbiting a star which is already notable for an immense debris disk located in an equivalent zone to our Kuiper Belt. I discussed Fomalhaut b in a scientific paper looking at mechanisms for planet-building in the outer solar system (1). I related how this presumed gas giant exoplanet was enshrouded in an immense cloud of dust. The dust cloud was the feature seen by the Hubble Space Telescope back in 2008. 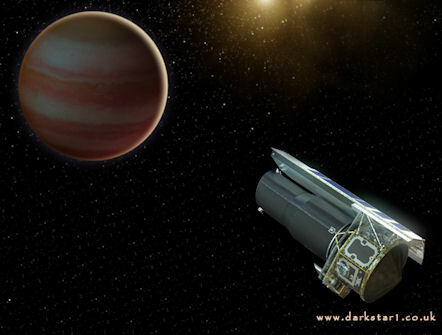 But probing the cloud in infrared using the Spitzer Space Telescope had failed to find the planet itself. At the time of writing, I was conscious of the arguments about Fomalhaut b, and how this might impact upon my own hypothesis about dust clouds obscuring outer planets from view (2). What I hadn't realised at the time (and should have!) is the very weird nature of Fomalhaut b's orbit. Perhaps the dust cloud mystery is the most unusual feature of this world (assuming it is just a single massive world under that shroud), but further analysis by NASA in 2013 provided data about its orbit. It turned out that Fomalhaut b's orbit is highly elliptical, ranging from a perihelion of about 50AU out to an aphelion of about 300AU (3). An equivalent object in the solar system would be an extended scattered disk object, beyond the Kuiper belt, like Sedna. Except that this is a gas giant planet. I realised then that this unusual exoplanet provides an even better precedent for a dust-enshrouded Planet X object. The star systems aren't the same, of course. Fomalhaut A, a bright white star in the constellation Pisces, is twice the mass of the Sun, and quite a lot younger. There's also the matter of its enormous debris disk, the presence of which may play a significant role in the mystery. The good news is that Fomalhaut b may plough through this debris disk in the next couple of decades, if its orbit is in the same plane as the disk (alternatively, it may be inclined, and miss it altogether). If it does interact with the disk, then we will learn much from the ensuing fireworks display! What no scientist is arguing is that Fomalhaut b may be normal. Maybe it's possible that just as comets brighten due to their halos of exuded materials, this exoplanet, which spends a huge amount of its life in the outer reaches of its star system, may come complete with a regular shroud of dust and debris. Perhaps it is the planets within the Sun's regular family that are unusual, being constantly 'cleaned' by the action of the solar wind and drag forces? Planets beyond this zone, beyond the heliopause, may be fuzzier affairs, complete with billowing winged disks of dusty debris. Fomalhaut b may be an extreme example of a more generalised principle, then, exacerbated by its periodic interactions with the broader debris disk around its star. Most stars, like ours, do not have such a feature. So, the results of cosmic interactions are altogether less apparent. In the case of our solar system, a Planet X body enshrouded in dust might become a faint, fuzzier object for astronomers, making it indistinguishable from a distant galaxy or nebula. The heat signature of the enshrouded planet may be curtailed by this local dark nebula, making it difficult to see in infrared sky surveys. Only if the planet were to approach the realm of the rest of the planets would these dusty features increase the planet's overall luminosity, as is the case with Fomalhaut b.
I will explore this further in my new book, and continue to pitch this idea before astronomers in the meantime. I'm about 40,000 words into the book now, and excited about the wide-ranging contents of this new non-fiction title. Living in Britain, weather is never far from one's mind. It's notoriously difficult to predict here, and is capable of changing dramatically, often more than once in a day. No wonder it's such a talking point among British people. But the intensity of the weather here is as nothing compared to that within the atmosphere of gas giants and ice giants. Scale that up further, and we can only begin to imagine the powerful forces controlling weather patterns in a brown dwarf. 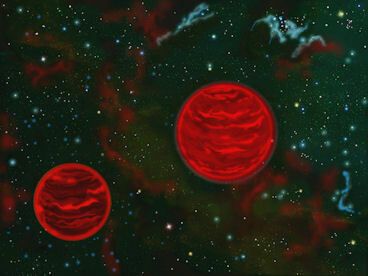 The cloudy atmospheres on these giant worlds (often considered to be failed stars) contain hot patchy clouds made of iron droplets and silicate dust. Like cloud cover here, these patches build and dissipate (raining liquid iron within sand storms? ), and shifts around the surface of the brown dwarf in discernable patterns, often banded at different latitudes - a feature clearly seen on Jupiter, and also Neptune. "“This is the first time we have seen atmospheric bands and waves in brown dwarfs,” said lead author Daniel Apai, associate professor of astronomy and planetary sciences at the University of Arizona in Tucson. Just as in Earth’s ocean, different types of waves can form in planetary atmospheres. For example, in Earth’s atmosphere, very long waves mix cold air from the polar regions to mid-latitudes, which often lead clouds to form or dissipate. This Neptune-like patterns to atmospheric movements includes variable wind conditions, zonal temperature differences, and bands at different latitudes moving in opposing directions (2).